Chucky, a 5 year old Belgian Malinois, was shot and killed on Friday, the 25th, after he was sent to try to subdue an individual. That’s the official line. The reality is that Chucky was ignorantly sent to his death by the BCSO supervisor on scene. Matthew Reyes Mireles had already lead multiple agencies on a vehicle chase when he dumped his car and proceeded on foot. Mireles was firing randomly at officers in addition to pointing his gun at the police helicopter and passing motorists. He had already shown his willingness to shoot. 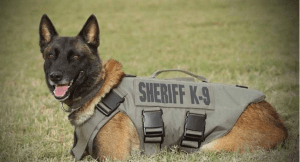 Why in the world would the BCSO supervisor on the scene give the order to send one of our precious K-9s after Mireles? What they hell did they think was going to happen? Not only did they send Chucky when they shouldn’t have but they didn’t even put his bullet proof vest on him. Sheriff Javier Salazar is trying to feed us some bull by saying there was no time to put the vest on Chucky. They had chased the man for over 30 minutes. He was now on foot walking down the road. Not running, walking! And they’re trying to say they didn’t have time to put a vest on him? But all that doesn’t matter. What matters is that Chucky should never have been deployed in the first place. Let’s see dog versus man with gun who has already been shooting at officers. It doesn’t take a rocket scientist to see how this would end. This is nothing short of gross negligence on the part of the BCSO and the Sheriff is just blowing smoke to try to cover up another failing under his questionable leadership. Rest in peace, Chucky. You deserved so much better. Click here for the MySanAntonio.com article on the incident. And click here for the article by KSAT where Sheriff Salazar tries to cover up their poor decision.